It's the end of another month, and I haven't had anything to say. So guess what that means! It's that time again folks: It's the Yellow Card Question Show! For today's theme song, we are going to borrow one from another show: Chibi Maruko Chan, aka 櫻桃小丸子, aka ماروكو الصغيرة, aka 마루코는 아홉살, etc. Choose your language and start the music playing: Japanese, German, Mandarin, Cantonese, Arabic, Korean. I'm sure there are Bahasa and Tagalog versions out there and perhaps some others, but I can't be bothered to find them at the moment. You'll just have to cope with these options. So what now? What we've all been waiting for -- let's have a question! Do your happy dances for a moment while I spin the wheel, roll the die, shuffle the deck, and blow on the tea leaves. Hmm. 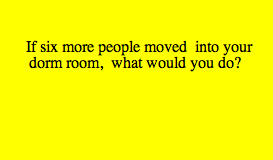 This question was meant for Chinese students who have three to five roommates in their dorm rooms. It doesn't quite make sense to ask it of myself, but then who said these questions had to make sense. Well, the simple answer is that I would go crazy. I don't have much furniture in my room, but I don't have much floor space either. I have just my one bedroll on the floor, various items of furniture and boxes along the walls, and a section of bare floor that I like to be able to walk on. I don't like walking on strangers, or friends for that matter. I suppose that if my "roommates" included those sleeping in my living room, than I would perhaps go a little less crazy, but there's not much out there to sleep on either. This silly building doesn't even have places to put hammock hooks! With no bunk beds, no hammocks, and shortage of couches, I just don't think there is any way 6 more people could live here, unless they slept in shifts. That might work. Both my current roommate and I do tend to alternate hours awake. For example, I sometimes sleep 7 PM to 9 PM and 2 AM to 8 AM, and my roomie might sleep 9 PM to 1 AM and 6 AM to noon. But still, a general increase in the average level of insanity would be unavoidable. That YCQ is WAY too easy! I didn't even have to think about that one. I would clearly MOVE OUT! I thought perhaps the government of a far eastern nation had somehow realized that you had a whole room to yourself and had decided to send some refugees to help you remember what it was like walking on the Great Wall. Whew! It was only theoretical! I would probably start taking everybody else's socks until there were none left... then I would sell them.